Porec is the most popular holiday resort in Istria and is frequently named the top resort in Croatia by the Croatian National Tourist Office. There are over 100,000 beds available in the area, but hotels and other facilities are widely spread so the place never feels too crowded. The main tourist areas are two bays south of the town, called Zelena (Green) and Plava (Blue) Laguna (lagoon). They are almost like small towns, with several hotels in each, as well as camping facilities, a marina and shopping and entertainment areas. Most visitors stay in one of the two. If you’re in the main part of town and fancy a bit of swimming and sunbathing, head to nearby Sveti Nikola island which you can reach by a regular boat (the journey is only a few minutes). It is more than likely that you will fly to Pula, which is the main airport in the region – see our Getting to Istria page for details of flights to Pula from the UK, Ireland and Europe. From the airport, there are public shuttle buses that operate to Porec – see the timetable on the FILS website. For more options, you could also transfer to the main bus terminal in Pula (either by taxi or transfer bus) and then take another bus from there to Porec. 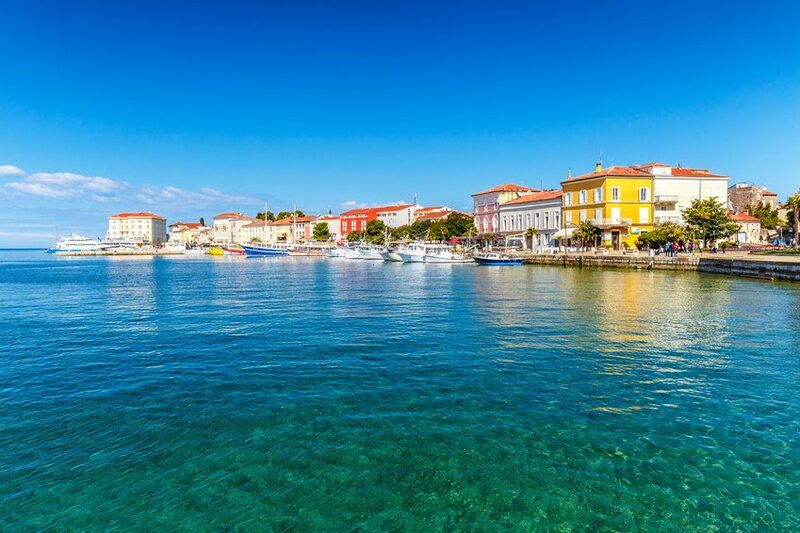 Alternatively, you may like to arrange a private transfer from Pula Airport direct to Porec, which may not work out too expensive if there are a number of you travelling together. Pula Airport is about 34 miles/55km south of Porec. You could also fly to Trieste and then get a bus to Porec, or fly to Venice and get a catamaran across. See our guides on travelling from Trieste and Venice to Croatia for details of bus and catamaran routes. 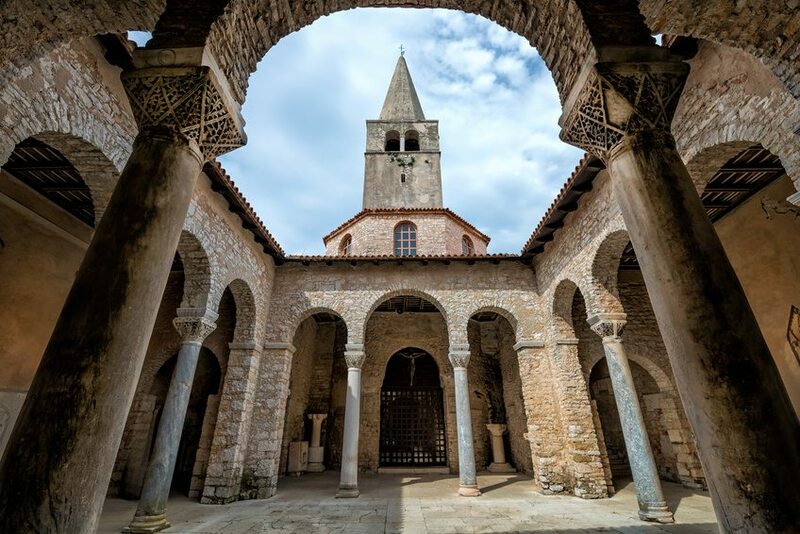 Porec’s history extends far, far back to prehistoric times. The largest settlement during this period was called Picugi, which was home to an Illyrian tribe called the Histri (which is where Istria gets its name) in around 800 BC. In 129 BC, the Romans succeeded (after various attempts) in capturing Istria and the Roman settlement Parentium – present-day Porec – emerged and evolved. It grew in strength and importance and included Roman military and army bases. After the fall of Rome, Porec came under the rule of various empires until it became part of the Venetian Empire in 1267 under whose control it remained until 1797. During Venice’s reign, Porec suffered considerably from plagues over the centuries so its population – which at one point was a healthy 3,000 people – only topped 100 people by 1646. The Venetians therefore brought in people from Dalmatia, Bosnia, Montenegro and Albania to help bolster the population of the town. When the Venetian Empire fell, Porec came under the control of the Austrian Empire until 1918, when it once again became Italian, as part of the Kingdom of Italy. During this period, the Slavic population was oppressed and some left to live in the Kingdom of Yugoslavia. Porec suffered quite badly during World War II, and was heavily bombed by the Allies, especially so during 1944 when 75% of houses in the town were destroyed. Istria (and Porec) was assigned to Yugoslavia in 1947, and in 1991 was part of Croatia when it declared independence. Given the town’s long history, a visit to the old town is a must due to its numerous historical sites. In particular, the 6th century Euphrasian Basilica (below) is wonderfully preserved and is well known for its beautiful gold mosaics. The Basilica is really a collection of various buildings, including a bapistry and the Bishop’s Palace. The entry to the church is free, although a small donation is much appreciated. The Basilica was declared a UNESCO World Heritage site in 1997. The Decumanus is the main street in Porec which runs east-west through the centre of the old town. It was also the main road during prehistoric and Roman times. Marafor Square (Trg Marafor) is where a Roman forum was once situated. Parts of two temples – to Neptune and Mars – can still be seen here. North of Marafor Square, the Parliament Buildings (of the then Istrian regional parliament; the buildings are now a museum) can be found. These were converted from a Franciscan church which was built in the 13th and 14th centuries. The tourist office is located at Zagrebacka 9, tel: 052 451 293, fax: 052 434 160, email: info@istria-porec.com. More information online can be found on the Porec Tourist Office website or at the Istria Tourist Board’s section on Porec. Please see our Accommodation in Porec page to see the range of hotels, apartments, rooms and more available in the town.